Also, it’s the end of the semester, so things are peak stressful. Here’s what’s up. PRAISE THE CYBORG GODS, Janelle Monae’s new album is out! It is a revelation. Buy it immediately or forfeit all pleasure. P.S. There’s a movie. This is not a drill. I bought a pink air fryer because of course I did. Gimme all the fried cauliflower. We added this runner to Chez Fig this week. Cute jute! My finals are all due in the next 11 days and I’m buggin’ hard. Anyone got any study tips? Did you watch the season finale of Jane the Virgin? I’m still shook. I need this one-piece for the beach! Also, this, because I’m predictable. New Kimbra is lit. Snag it. I bought another pair of the same Warby Parkers because I am so in love with them. Who trusted me with a credit card? I writing a paper on solo performance, stand-up, and gender, and I’m focusing on the work of comic Rhea Butcher. Get their album Butcher and their collab with wife Cameron Esposito, Back to Back! Michelle Wolf is the hero we need, but don’t deserve. It’s official! Nice weather is back. It was 80 degrees and sunny today! I live for shorteralls, so this is very good news! I didn’t have to work today (praise), so I stayed in pajamas until almost 2. When I finally worked up the motivation to shower and put on clothes I had to rush out the door to cash in our cans before the redemption center closed. I know. Exciting life! 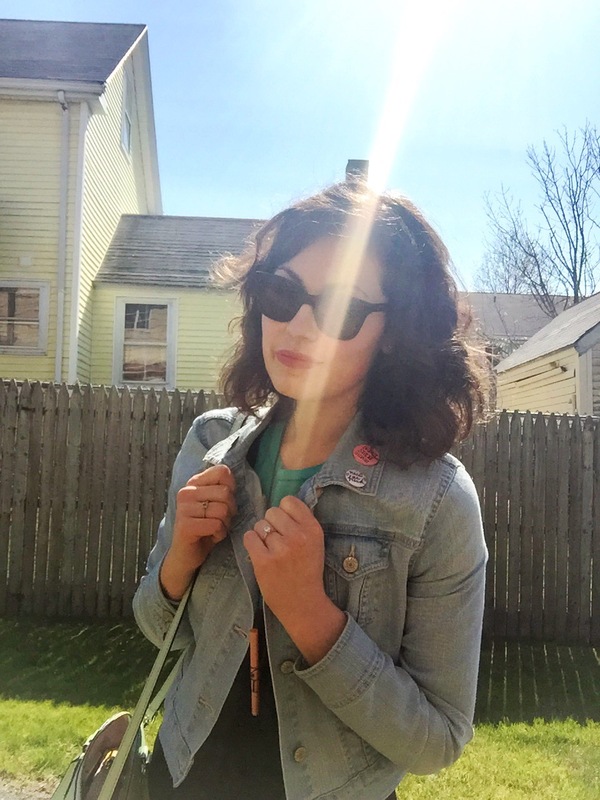 I bought this denim jacket about a million years ago at Old Navy. I don’t shop there anymore because working in retail has made me a little snobby, but this jacket is my absolute favorite. It goes with everything. It’s like the Sisterhood of the Traveling Jacket. My fiancé is an inch shorter than me (much to both of our chagrin), so whenever he’s not around I make sure to rock platforms like it’s my job! I haven’t really gotten into the enamel pin trend, and now with the Spending Fast, I don’t have the option, but when Cameron Esposito put out her last special, Marriage Material, she had some pins available as merch. This one says “Breast Stroke Specialist” and the other (on my opposite lapel) is a Chinese food take-out box filled with sperms. It brings me soooo much life. The other button is handmade merch from the NAF/M. Ward show at Royale last weekend (which was amazing). I’m hoping that the beautiful weather brings me more energy! I have been dead tired for weeks—I think it’s a side effect of spring allergies. If you need me, I’ll be outside forever!